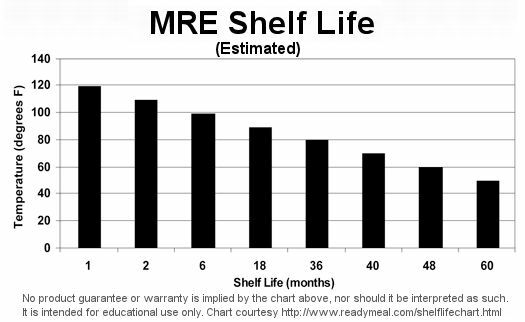 here's the chart under MRE Storage on the site. couple of weeks, depending on previous storage, should be ok for the next little bit. Don't think I'd earmark it for long term, tho. Thank you! I had a feeling it should be okay for the most part, but wanted to ask y'all in case it might just be lost. Bad mre's aren't fun. Do you have a whole case with TTI sticker or just single MREs without the sticker? Unfortunately just the single one that my dad was given by a friend of his. I wish I had a full case with the TTI sticker.